We all look forward to a perfect get away. If you are going to Vegas or the beach, here are some easy tips to stay on track with your health goals. 1. Drink LOTS of water. On vacation, it’s easy to forget to drink enough water. Keep your water intake up by trying to drink one glass or bottle of water every hour over the day. Sodas and high sugar fruit juice just does not do the trick! Hydrate with water! 2. Eating healthy snacks like fresh fruits and vegetables are key to keeping slim and trim on your vacation. They are tasty, filling, assessable and easy to manage. 3. Sunscreen can save the day! The sun provides us a very important vitamin, Vitamin D. You can expose your skin for 10-15 minutes in the sun before you put your sunscreen on if you want to absorb this precious vitamin. After that, lather up! Water, sweat, toweling off all will remove your sunscreen. Reapply even if it is waterproof! Hind in the shade as much as you can as well. 4. Get some exercise when you can. I know, exercise on vacation? Keeping active will help keep you good spirits and ready for anything! 5. Have fun! Put your cell phone, smart phone, tablets and electronics away! 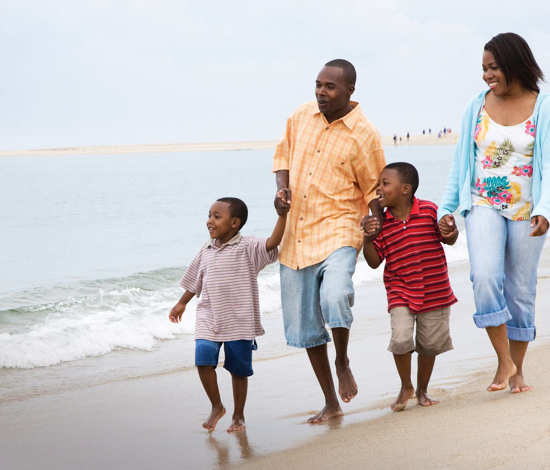 Take a break for all the hustle and bustle and ENJOY your vacation. Stress is one of the leading causes of illness. De-stress, unwind, and relax! Enjoy your vacation time and come back feeling refreshed! I use this strategy for a weekend away or a long vacation. Enjoy yourself and relax!